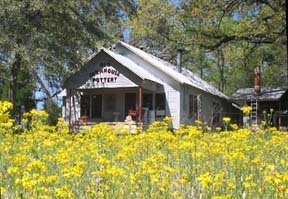 Old Farmhouse Pottery is located half a mile down a back road, close to the town of Maydelle, Texas. See our Contact page for directions to the shop. 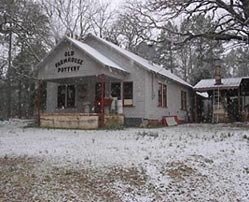 The 1936 farmhouse is divided into two large rooms, a work area for making pottery, and a showroom displaying finished pottery. The kiln is located close to the back door. Visitors to the shop are welcome to tour the kiln and work areas, as well as look at the pottery for sale. Notice the pottery cups hanging from the rafter tails and the pots mounted along the ridge of the roof. 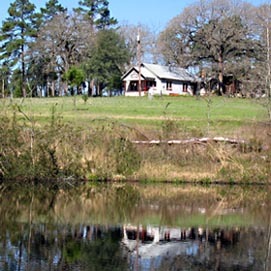 The view from the pottery farmhouse takes in a 5 acre pasture with scattered trees and a small pond, which is about 80 yards away. Beyond that is mixed pine and hardwood forest land. A rare snowfall in 2004. 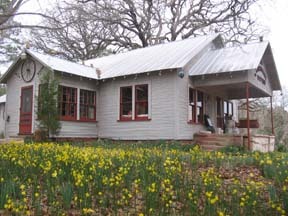 The pottery shop in spring ragweed season (left) and daffodil season (right). 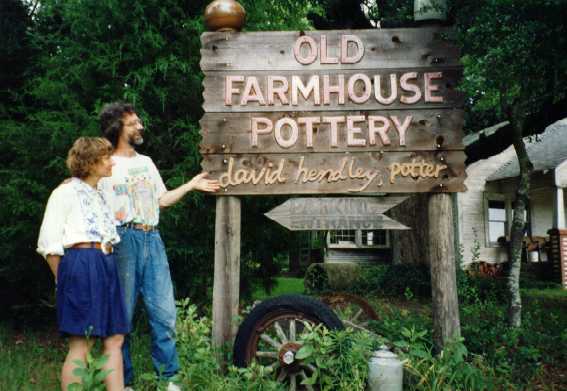 David Hendley has been making pottery since 1972. Most of the pieces are made on the potter's wheel. 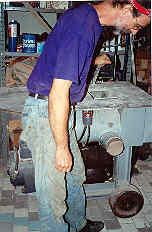 The variable speed electric wheel is one of his few concessions to modern technology, and one of the few pieces of equipment that David didn't make himself, in the shop. 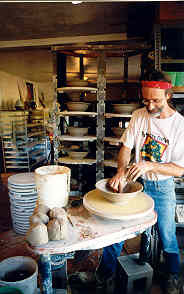 Although most people imagine a potter working at a wheel when handmade pottery is mentioned, David actually spends only about two days a week working on the wheel. 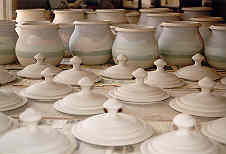 Jobs such as making clay, formulating glazes, attaching handles, painting pottery, and firing the kiln take much more time than making the basic shapes on the wheel. The balls of clay piled up on the table will all shortly be made into bowls. Pottery is always made in a series, with 10 to 40 similar pieces, depending on size and complexity, made at the same time. Since all the pieces are handmade, there are slight variations in each piece. When this series of canister jars and lids has dried, a game of "musical lids" will determine which lids best fit on which jars. 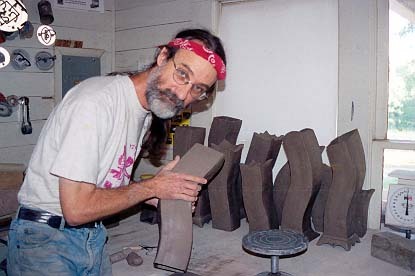 David uses his clay extruder to make handles and feet for pots, as well as to make whole pots. He has built several extruders and still uses the extruder he built in 1975. Often the clay is twisted, curved, or distorted as it exits the extruder. An expansion box fits on the end of the extruder to allow for making larger forms. These square hollow extrusions are being made into vases. Although the basic shapes can be quickly made with the extruder, many hours of work is required to turn the extrusions into vases. Notice the extruder dies hanging on the wall. 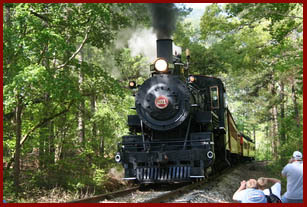 The die used to create these forms is visible in the top left corner of the photograph. The dies are made from old highway signs bought at the junk yard, which accounts for their reflective surface. Before he can start making pottery, David has to mix his claybody. 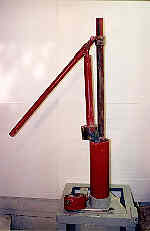 The pugmill, pictured here, is similar to a large sausage grinder, with two augers that blend and mix the clay. 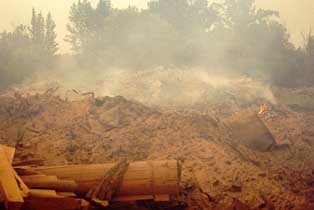 Most of the clay is local East Texas clay, mined and blended by Black Jack Clay in Marshall, Texas. David adds other ingredients to make the final clay mixture, such as feldspar from South Carolina and kaolin from Florida. 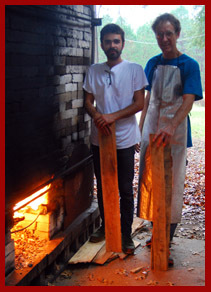 The kiln at Old Farmhouse Pottery is heated entirely by burning wood. 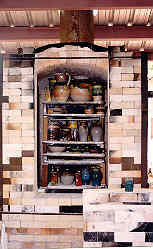 It is fired once or twice a month, when enough pottery has been made and dried to fill the kiln. 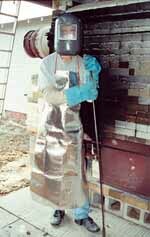 A firing takes about 10 hours to reach 2400�F, and two and a half days to cool enough to remove the finished pottery. The kiln has two fireboxes, which must be stoked once every minute or so to keep the temperature rising. Fuel for the kiln comes in the form of scrap from a local pallet factory. 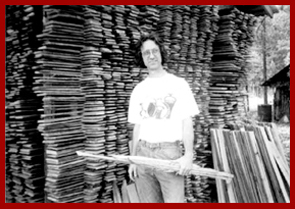 The boards are already cut to size, but must be carefully stacked so they can dry for several months before use. Waste wood from a pallet factory is stacked to dry, ready to burn in the kiln. 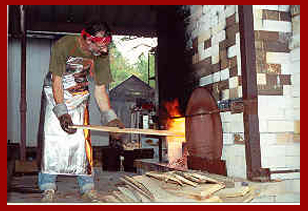 Stoking wood in the kiln. It takes about 10 hours of feeding wood to reach Cone 10, almost 2400 degrees. 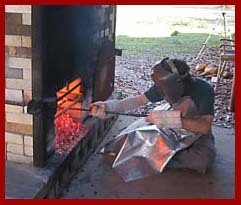 Once the kiln reaches about 2300 degrees, there is fire everywhere! Flames are coming out the top of the chimney and around gaps in the door, and licking the kiln wall above the fireboxes. Unfortunately, every firing of the kiln produces a few pots of less than perfect quality. 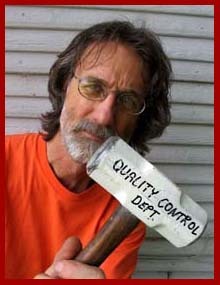 The "Quality Control Hammer" takes care those defective pots! 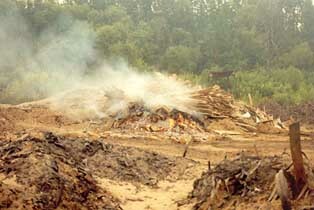 Although the kiln produces some smoke when firing, the wood that is burned in the kiln is retrieved from a pallet factory, where it would otherwise be burned on site (above). 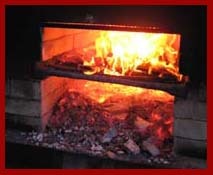 The dried wood and the high temperature of the kiln means that the wood will be more efficiently burned with minimal smoke. Downtown Maydelle is a mile and a half from the pottery shop. 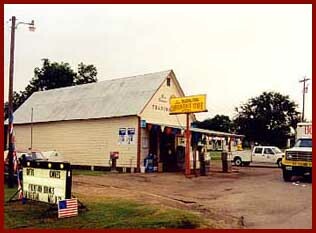 The Old Cherokee Trading Post is the local convenience store. 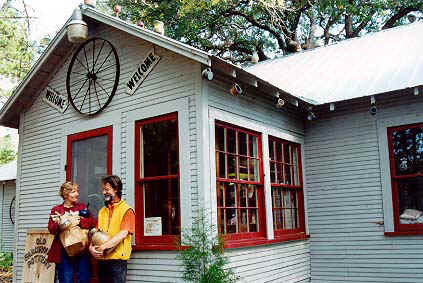 Maydelle Country Wines is a fw miles from the pottery shop. They specialize in unusual wines such as peach wine, blackberry and elderberry wines, and lime wine - called a "Maydelle Margarita" by the locals. 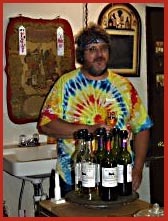 Steve Harper has been making wine for many years and also sells wine making supplies. 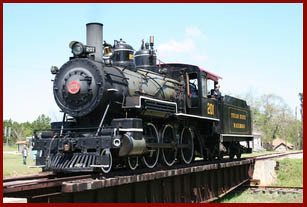 The Texas State Railroad, an old-timey steam engine tourist train passes through Maydelle. Fun for the whole family. 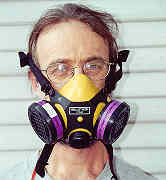 If you work with dusty clay always wear your respirator!